Joint Base Langley-Eustis (JBLE) is located on the Virginia Peninsula on the southeastern coast of the state. Hampton Roads is the name of the metropolitan area as well as a body of water surrounding the region. Langley AFB is located in Hampton while Ft. Eustis is in Newport News; both are just a few miles off of Interstate 64. Although JBLE is a joint base, it is not contiguous. There are 17 miles of interstate between the installations. Hampton Roads is known for its large military presence. You will find all branches of the military in the region. JBLE is home to the 633rd Air Base Wing, Air Combat Command, U.S. Army Training and Doctrine Command, and many other units on the tip of the spear. Visit JBLE's website and the Facebook page. The Hampton Roads community is rich in history and beauty. Langley and Ft. Eustis are roughly 55 miles south of Richmond, the state capital and 40 miles north of Virginia Beach. Historic sites, extraordinary museums, and countless miles of scenic waterways and hiking trails are here for your exploration; the mountains only a few hours' drive to the west. Almost 2 million people call the Hampton Roads area home. Compared to the rest of the country Hampton's cost of living is 6% lower than the national average. Langley Field was named after Samuel Pierpoint Langley, an aerodynamic pioneer and a former Secretary of the Smithsonian Institution. Langley began aerodynamic experiments in 1887 and formed a basis for practical pioneer aviation. He built and saw the first steam model airplane in 1896 and the first gasoline model in 1903. Both planes were capable of flight. He also built the first man-carrying gasoline airplane in 1903, which he never succeeded in launching. Langley Field was the first Air Service base built especially for air power, and is the oldest continually active air force base in the world. 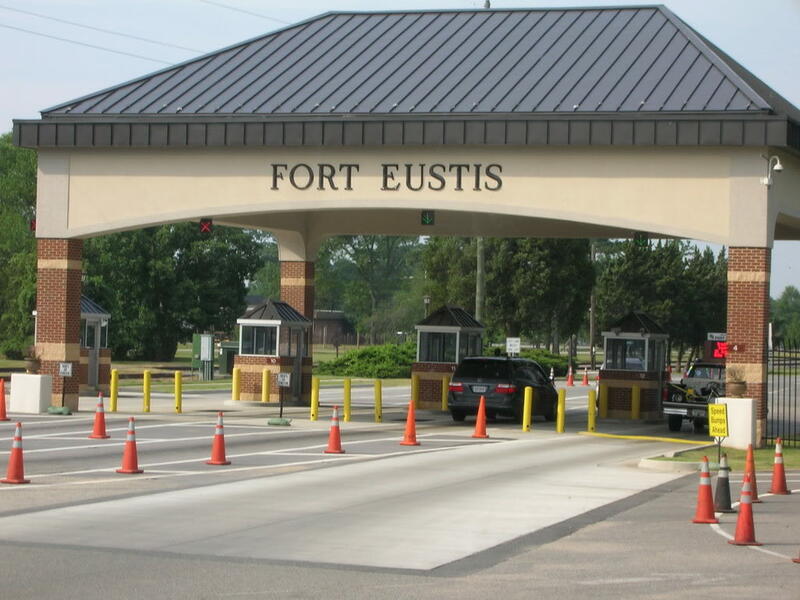 Fort Eustis is one of 16 Training and Doctrine Command installations. It is the Spearhead of Logistics, home of the US Army Training and Doctrine Command. The 633rd Air Base Wing is comprised of three groups that provide installation support to more than 9,000 military and civilian personnel including Headquarters Air Combat Command and three operational wings. The Wing provides mission-ready expeditionary Airmen to combatant commanders in support of joint and combined operations worldwide. The activation of the 633 ABW as the new host unit for Langley Air Force Base, Va., Jan. 7, 2010, was the first step toward Joint Base Langley-Eustis. The TRADOC Commander's vision is to lead the Army's transition into the future by shaping the Army of 2020, developing adaptive leaders and organizations, modernizing equipment, and revolutionizing training to strengthen the Nation's adaptive land force for decisive action. Together, JBLE serves a large population made up of over 145,000 active duty, guard and reserve, family members, civilians, contractors, and retirees. Ft Eustis also trains an additional 12,000 students annually. Langley is located in the city of Hampton on the Virginia Peninsula. The community surrounding the base is known as Hampton Roads. If you are traveling southeast from Richmond on Interstate 64 East to Langley, merge onto US-258 (Mercury Blvd) via exit 263-B and travel 2.1 miles. Be in the right lane and merge onto VA 167 E (LaSalle Avenue)and you will dead-end into the base gate. If you are traveling northeast from the James River Bridge via U.S. Route 17-258, take West Mercury Boulevard to LaSalle Avenue. If traveling north from Norfolk, take Interstate 64 West through the Hampton Roads Bridge Tunnel to exit 265-B and turn right onto LaSalle Blvd. If you are approaching Hampton traveling from Emporia (I-95) take US-58 E for approx. 66 miles. Merge onto I-64 E/Hampton Roads via exit 1B toward Norfolk/Va Beach. Shortly thereafter, take exit 265-C toward Langley AFB. Turn right onto Rip Rap Road; then a slight right onto Armistead Ave, and another short right onto LaSalle Avenue. If you are traveling south on Hwy 17, continue until you reach Interstate 64. Take the interstate east until you exit at Armistead Avenue (north)and then to LaSalle Ave. Directions from Newport News/Williamsburg International Airport, Norfolk International Airport, and points East: Take Interstate 64 West to exit 250A, Fort Eustis Blvd (Route 105) proceed west about 1 mile and you will enter Fort Eustis. Directions from I 95 and points West (Richmond): Take Interstate 64 East to exit 250A, Fort Eustis Blvd. (Route 105) proceed west about 1 mile and you will enter Fort Eustis. If you are traveling south on Hwy 17, continue until you reach Ft Eustis Blvd. This will lead you directly into Ft Eustis. If you are traveling via air, please make sure that you have someone to meet your flight or make rental car arrangements. There are two airports in the local area: Newport News/Williamsburg International (airport code is PHF) and Norfolk International (airport code is ORF). There is no shuttle service to either installation from either airport. Taxi fees range from $30-$60. There is a 100% ID check at all gates at all times. Be sure that all adults in the vehicle have their ID's to present to the gate guard upon arrival. If you are driving a rental car, present the rental contract with your authorized ID. No listings found for Fort Eustis.